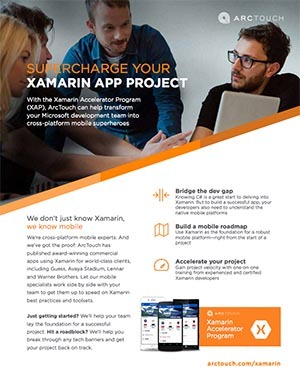 SAN FRANCISCO — ArcTouch, a full-service mobile and connected experiences studio, today announced its Xamarin Accelerator Program (XAP), a consulting service to help enterprise development teams build successful cross-platform mobile apps using Microsoft’s Visual Studio tools for Xamarin. The market for mobile enterprise applications is estimated to reach USD $98 Billion by 2021. And according to a Forrester report, enterprises can dramatically reduce their costs and shorten the time to market if they use Xamarin for their cross-platform mobile projects. Xamarin helps development teams use a common codebase across mobile apps for iOS, Android and Windows. However, to build a successful mobile app with Xamarin, enterprise teams need to become experts with native mobile platforms. With years of experience building commercial applications for high-profile clients in the retail, entertainment, travel and sports industries, ArcTouch is uniquely positioned to help companies and their Xamarin development teams succeed. For more information about the ArcTouch Xamarin Accelerator Program, please visit arctouch.com/xamarin.